Successfully Added Bluetooth Landline Phone Adapter to your Shopping Cart. Use any Bluetooth headset with your home or office landline phone! This easy to use Bluetooth phone adapter allows you to use any Bluetooth headset with your landline telephone for wireless communication. Simply connect the phone line to the Bluetooth adapter, turn your Bluetooth headset to ON, then press the PAIR button on the Bluetooth adapter. That’s it! You know have the freedom to move around your home or office while talking on your landline phone! This Bluetooth adapter is not limited to landline use either. With the B18 Bluetooth adapter you can even connect it to your PC and chat with people from Skype, Google Talk, MSN Messenger, VOIP and more. This allows you to complete task such as cleaning, cooking, or baby sitting, all while chatting with your online friends! 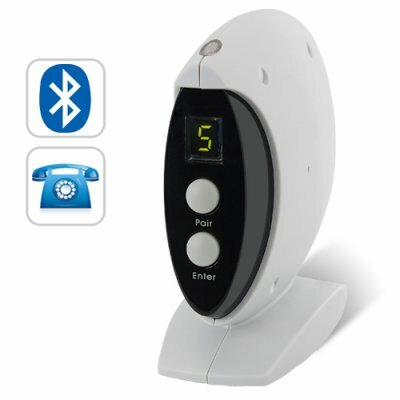 If you’re a parent of a child then this device will allow you to look after your toddler while talking on your landline phone and without the use of your hands or messy wires. Want to increase your productivity at the office? Not a problem. Connect the B18 Bluetooth adapter to your office landline and you can walk around your office up to 10meters away in crystal clear hands-free communication. This gives you the freedom to make photocopies, send faxes, or file invoices, while at the same time maintaining a conversation with your client or boss. Search Google and you’ll see how the same device sells for close to double the price. If you’re looking for a unique resale item that can make you some great profit before everyone else, then the CVPM-B18 is the product for you. Place your orders today while supplies last and we will express ship it to you by tomorrow. Don't forget, this Bluetooth adapter comes with our famous 12 month guarantee and is in stock now in our warehouse right now. Available only from the leaders in wholesale electronics, Chinavasion! Ships with plug adapter of your choice to fit the specific power outlet of your country. Can I get my company logo printed on the B18? Yes. If your bulk order is more than 500 we can get your company logo or name printed on this product. Will this product work in the USA? Yes. This product will work worldwide.